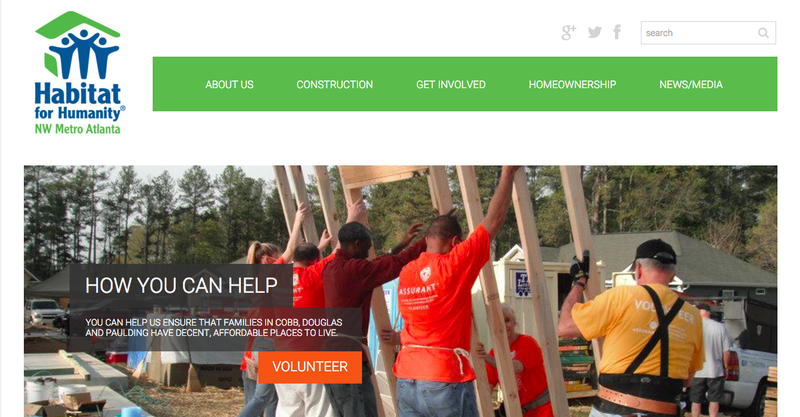 The NW Metro Atlanta Habitat for Humanity affiliate had a new executive director and was changing its fundraising and sponsorship program. The affiliate wanted to better connect with the faith based and business communities as well as its volunteers. Habitat is one of the world’s leading brands. A new strategic messaging and communications plan was developed to leverage that brand and more clearly communicate specific messages about Habitat’s operation. The firm redesigned a new and engaging website with new photography, video and new content. The new website is also responsive to mobile devices. An aggressive social media program was launched and major improvements were made in media relations in the promotion of the affiliates work. In addition, new marketing collaterals were developed as a family look of brochures to support new sales strategies. A great deal of attention was brought to the groundbreakings, dedications of completed Habitat Houses, the 2015 Keys to Hope sponsor reception and other special events through media relations, social media and the new website. The website received great engagement and the bounce rate dropped significantly. The average time a user spent on the website was three minutes and over 75% were new visitors. New collateral design utilized new content and photography to showcase the affiliate’s work in Cobb, Douglas and Paulding Counties. The affiliate received three new sponsorships in 2015. Digital marketing efforts showed an efficient result. Facebook fans increased by 27% and engagement averaged at 11%, an increase with a new and strategic campaign. The growth was organic and no paid advertisement was used. Habitat’s Twitter base grew by 16 percent. Through these actions, the affiliate was able to raise its profile in the community and find a number of new house sponsors.